Through our Advocacy Committee, Therapeutic Recreation Ontario advocates on behalf of the profession and its members to government, employers and other professional partners. TRO Salary survey analysis now available! FEBRUARY 5 – As many members may recall, TRO conducted a salary survey in 2018 to get a clearer picture of compensation for TR professionals in a variety of settings across the province, and to provide a resource so you can better advocate for yourself and your profession with your employer or union. Following the preliminary report that was released at the 2018 Annual General Meeting at the TRO Conference, we are pleased to announce that [drum roll please] the TRO 2018 Salary Survey Report is now available! This comprehensive, detailed analysis offers a breakdown of salary data by region, work setting, years of experience, and much more. What are the most important factors that determine your level of compensation as a TR professional in Ontario? Is it years of experience? Geographic location? Check out the report to find out! TRO sincerely appreciates the exhaustive efforts of the members of the Salary Survey Working Group and the long hours they put into creating this report. They are: Sonia Roul, R/TRO (Chair), Sadie Friesner, R/TRO, Stacy Jowett, R/TRO, Tiina Liinamaa, Deborah Pugh, and Executive Director, Rozalyn Werner-Arcé. that government study the role and value of Recreation Therapy in institutional and community-based health care and social service programs. the establishment of hiring standards including consistent education requirements, job titles and compensation for Recreation Therapists regardless of sector. the establishment of a life enrichment protected envelope of funding that supports TR in LTC settings, including reducing the ratio of residents to Recreation Therapists. You can read TRO’s full message to the Ontario MInistry of Finance here. DECEMBER 2018 – In an ongoing effort to provide greater clarity to help TRO members better understand the implications of the controlled act of psychotherapy, TRO’s College of Psychotherapy Working Group has received new insights from the College of Registered Psychotherapists of Ontario (CRPO). Background: The Psychotherapy Act (2007) was created by the Ontario government as a means to regulate several new health professions in Ontario. As of December 2017, the controlled act of psychotherapy came into force, which means it has become law. The Ontario government’s proclamation of the Controlled Act was accompanied by a two-year transition period, from December 31, 2017 to December 31, 2019. During this time, individuals who provide psychotherapy have the opportunity to become registered with an appropriate health regulatory college if they wish to continue to perform the controlled act of psychotherapy or to change their practice (Rosen Sunshine, 2018). Recent Updates: In October 2018, the TRO-CPWG received and studied the “Controlled Act Task Group Consultation Documents.” This material has served to clarify some questions, which Therapeutic Recreation professionals identified, regarding CRPO. Specifically, CRPO published a self-assessment tool which the working group also spent time studying. While valuable, these documents still did not clearly address all questions from the membership. The TRO-CPWG developed further questions regarding Therapeutic Recreation scope of practice within mental health and addictions settings. These questions were sent to CRPO on November 14, 2018. We are pleased to report a response was received December 4, 2018, and that the TRO-CPWG met December 13, 2018 to discuss the reply. The TRO-CPWG is pleased to share our questions along with the CRPO’s responses in this letter. We are confident the responses bring greater clarity to multiple issues specific to TR scope of practice and psychotherapy. APRIL 24, 2018 – TRO President Leanne Hughes, R/TRO, CTRS and Rozalyn Werner-Arcé, Executive Director, met with Jeff Yurek, MPP for Elgin-Middlesex-London and the Health Critic for the Progressive Conservative (PC) party. We shared with him the same presentation that we did with the Senior Policy Advisor to Health Minister Helena Jaczek, France Gélinas, MPP and NDP Health Critic, and John Fraser, MPP and Parliamentary Assistant to the Minister of Health and Long-Term Care. Mr. Yurek asked great questions to better understand what we were asking for, and was supportive of our messages. He said he would ensure that our information about Therapeutic Recreation would be passed along to whoever formed the next government after June 7, 2018 (the date of the next provincial election). As a Recreation Therapist (at name of workplace or in name of community), I would like to thank you for meeting with the representatives from Therapeutic Recreation Ontario (TRO) and for taking the time to learn more about Therapeutic Recreation (TR). I hope, that given the opportunity, you will advocate for Therapeutic Recreation in your constituency and at the provincial level. I am particularly concerned about the hiring stands being utilized for Recreation Therapists and the ratios of TRs to residents. As well, consideration needs to be given to having a protected envelope of funding that supports TR in LTC. Also, with the changes that have occurred with Home and Community Care, I hope consideration will be given to bringing in TRs as one of the allied health that people will have access to in this program. Once a person is up and dressed, then what do they do with their day? That’s where TR plays a meaningful role when delivered by qualified practitioners. APRIL 18, 2018 – TRO board director Jackie Frail, R/TRO and executive director, Rozalyn Werner-Arcé met with France Gélinas, MPP for the Nickel Belt riding and NDP Health Critic on Wednesday, April 18, 2018. They took the opportunity to discuss the role of recreation therapy and its value in long-term care. Having worked in healthcare as a physiotherapist, Ms. Gélinas has experience working with Recreation Therapy (RT) professionals in Complex Continuing Care. It was clear from our conversation that she understands the role and value of Therapeutic Recreation (TR), particularly when it comes to people who have experienced a sudden change in their health and well-being. By taking the opportunity to talk about TR in LTC, TRO was able to educate Ms. Gélinas about the need for hiring standards as well as the need for a consistent and reasonable ratio of TR to residents. She was surprised to learn about ​the fact that seniors living in long-term care are often at greater risk of social isolation and loneliness. Additionally, we asked Ms. Gélinas to be a champion for TR and advocate for the practice. A copy of the discussion presentation can be found here. 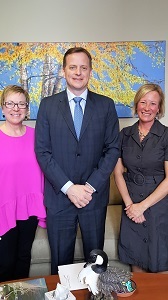 APRIL 11 and 12, 2018 – TRO President Leanne Hughes, R/TRO, CTRS, Board Director, Jackie Frail, R/TRO and Executive Director, Rozalyn Werner-Arcé met with Daniel Oettl, Senior Policy Advisor to the Minister of Seniors Affairs, Dipika Damerla to discuss the role of TR within the Aging with Confidence: Ontario's Action Plan for Seniors. During the half hour meeting, we took the opportunity to talk about TRO as the provincial association that represents 1700 members, what Recreation Therapy is and is not, as well as why it is important to hire qualified TR professionals. We identified ways that TR can fulfil strategies within the Aging with Confidence document and the benefits to seniors in the community. Therapeutic Recreation can mean the difference between thriving rather than existing in the community. TR not only improves quality of life and wellness, but also addresses many of the other pressing issues seniors experience such as social isolation and depression. Therapeutic Recreation must be available and easily accessible by seniors through annualized, dedicated funding in Seniors Active Living Centres. The ratio of TR staff to seniors must be kept at a reasonable level to ensure programs are tailored to address individual needs vs. arbitrary programs which lack a person-centred focus. 2. Establish hiring standards which include consistent education requirements, job titles and appropriate compensation for TRs. A qualified TR professional has graduated with a degree, diploma or post-graduate certificate from a recognized Recreation Therapy post-secondary program. Excellence is demonstrated through the Registered with TRO designation (RTRO, R/TRO DIP). Consistent programming delivered by qualified TR professionals will be vital to the physical, mental and emotional health and well-being of seniors as they transition from community to long-term care homes. Further discussion included Naturally Occurring Retirement Communities (NORCs) and the role that Recreation Therapy could play within those. TRO will reach out to key stakeholders relevant to NORC’s and continue to advocate on behalf of TR and TR professionals. On Thursday, April 12, TRO had two meetings with officials within the MOHLTC. 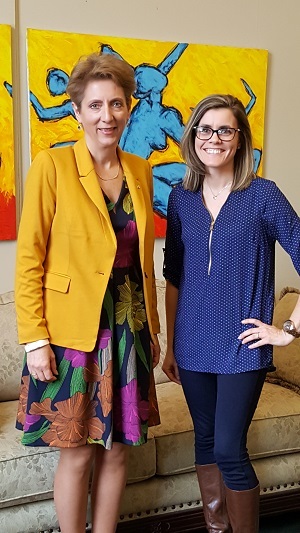 The first meeting that TRO President Leanne Hughes, R/TRO, CTRS, President-Elect, Katherine Plested, R/TRO and Executive Director, Rozalyn Werner-Arcé had was with Ian Chesney, Senior Policy Advisor to the Minister of Health and Long-Term Care, Helena Jaczek. The second meeting was with Nicole Donaldson, Acting Manager of Programs Unit, Licencing and Policy Branch, Bryan Sarles, Senior Program Consultant and Metoo Mach, Senior Financial Policy Advisor. Discussion included the fact that the government is investing $300 million in LTC and opening 5,000 more beds. Their first priorities are nursing and personal support, followed by other therapies, which is where TR would fit. Going forward, it will be important to demonstrate how TR intersects with behavioural and dementia supports. At the meeting with Nicole Donaldson and her team, there was a greater focus on how TR fits within the Falls Prevention Strategy and palliative care. We welcome input/comment from TRO members who are working within either of these two areas to help demonstrate the role recreation therapy has within them. A copy of the discussion presentation with Ian Chesney, Senior Policy Advisor to the Minister of Health and Long-Term Care, Helena Jaczek can be found here. A copy of the discussion presentation with Nicole Donaldson, Acting Manager of Programs Unit, Licencing and Policy Branch, Bryan Sarles, Senior Program Consultant and Metoo Mach, Senior Financial Policy Advisor can be found here. TRO will continue to seek ways to advocate for the profession of Therapeutic Recreation and on behalf of its members. With the province’s aging population and the vast majority of seniors who want to age at home and in the community, we are confident that there is a role for TR professionals to help seniors with access to services, transportation, housing options, wellness, social connections and active engagement. FEBRUARY 1, 2018 – Upon receiving an invitation from Ontario’s Ministry of Finance to participate, Rozalyn Werner-Arcé, Executive Director represented TRO at the in pre-budget consultations in Oshawa on February 1, 2018. Charles Sousa, Minister of Finance and a local MPP, Joe Dickson were in attendance. These public consultations are taking place in several communities around the province. Additionally, the Ministry is conducting telephone town hall meetings and welcoming written submissions. The consultations, no matter what their format, are an opportunity for members of the public including businesses and the non-profit sector, to provide input to the government as they plan the 2018 budget. Last year, 71,000 people participated in consultations. All the public consultations are recorded and transcribed and made available to the policy staff at Queen’s Park who cross-reference the presentations to written material they receive. Presentations are three minutes long – timed by a stopwatch. Click here to see the attached remarks. And the establishment of hiring standards including consistent education requirements, job titles and adequate compensation. If you have any comments, please feel free to contact Rozalyn Werner-Arcé, Executive Director. NOVEMBER 29, 2017 – TRO president Leanne Hughes, TRO member Sherry Dupuis, and TRO ED Rozalyn Werner-Arcé met with Member of Provincial Parliament (MPP) John Fraser at Queen’s Park to discuss TR in Long Term Care. TRO requested the meeting in response to the CBC radio show, Ontario Today, upon which Mr. Fraser, who is also Parliamentary Assistant to the Minister of Long-Term Care, was a guest. The topic was long-term care and callers were invited to speak about their concerns. Following the show, TRO requested an opportunity to inform Mr. Fraser about the value and impact of TR in long term care and demonstrate how it can address many of the concerns expressed. TR is able to support well-lived lives in LTC, including supporting the wellness of residents, families and other staff. This requires removing TR from the Nursing budget and establishing a life enrichment protected envelope of funding that would support TR in LTC settings and establishing hiring standards which include consistent education requirements, job titles and adequate compensation for TRs. Thriving rather than existing in LTC requires the valuing and inclusion of therapeutic recreation. TR not only improves quality of life and wellness but also addresses many of the other pressing issues in long-term care such as decreasing responsive behaviours and reducing the need for psychotropic medications. Approaches to LTC currently privilege managing bodies and just surviving/existing. Yet, researchers and professionals alike from across the globe have been calling for the urgent need for culture change in LTC, culture change that moves away from medical models that focus on body care to person-centred and relational models that support living life to the fullest and nurturing strong relationships between all in the LTC context. Mr. Fraser advised TRO that separating TR funding from nursing was an uphill battle. TRO is aware that the province has a very challenging fiscal situation and any new requests for funding are unlikely to be considered at this time. However, we believe it is important to continue to meet with both public servants and politicians to create greater awareness about Therapeutic Recreation to eventually get it on the government’s health care agenda. A copy of the speaking notes can be found here. If you have any comments, please feel free to contact Leanne Hughes, President or Rozalyn Werner-Arcé, Executive Director. 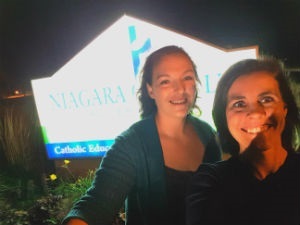 ON OCTOBER 4, 2017, TRO member Rebecca Cole-Zimmer along with TRO Board Director Jackie Frail, R/TRO presented to the Niagara Catholic District School Board (NCDSB) Special Education Advisory Committee (SEAC) introducing Therapeutic Recreation (TR) as an intervention for their students. Rebecca began this advocacy initiative by discussing the potential role for TR in a school setting with the principal at her children's school. The principal suggested that Rebecca connect with SEAC to introduce TR as an intervention for their students. After reaching out to her professor at Niagara College Jackie Frail, R/TRO and the TRO office for support she helped to create a professional presentation advocating for TR services within a school setting. The presentation was received enthusiastically by the SEAC committee as they seemed excited to learn about existing services like the Niagara College sensory room, they were open to the idea of TR students completing placements in their schools and were interested in learning how to access services. Learn more about Rebecca’s advocacy journey and their presentation on the TRO Blog! ON SEPTEMBER 28, 2017, TRO past-president Sue Verrilli, R/TRO and TRO member, Anne Scanlon presented to members of the Behaviour Supports Ontario (BSO) Provincial Coordinating Office (PCO) Operations Committee focusing on the value and role of Therapeutic Recreation (TR) in long term care and in community. Sue provided an overall understanding of TR and the work TRO has undertaken to advance the profession including our development of the Code of Ethics, Standards of Practice, Essential Competency Framework and Scope of Practice, all of which are put into practice by TRO members across the province. Anne, who worked in Complex Continuing Care and Long Term Care until two years ago when she joined the Community Responsive Behaviour Team in Waterloo-Wellington, spoke to the role of TR as it relates to the BSO and specifically to her role on the Waterloo-Wellington Community Responsive Behaviour Team. She also gave several examples across different practice areas of how TR has been implemented with positive outcomes for the individual and their families and/or the professionals who support them. The timeliness of their presentation is significant as additional annualized funding of $10 million for BSO will be implemented in 2017-18. Anne and Sue strategically positioned TR as one of the strategies BSO teams around the province should consider as they develop plans to effectively address the increasing need for responsive behaviour supports. APRIL 10, 2017 – As many TRO members will know, in February 2010, TRO submitted a letter of intent to apply for regulation under RHPA. Unfortunately, the process was stalled because the application for regulation criteria changed. Professions needed to prove risk of harm to the public before they could move forward with their applications. This requirement, in addition to the financial and administrative challenges, proved to be a significant barrier for TRO. Since that time, many professions have not been recommended for regulation under RHPA by HPRAC, including paramedics and physician assistants. Today, rumours abound about what is happening with regulation in Ontario including umbrella colleges and public registries. There are many healthcare professions that want to become regulated, but simply do not have the means or size of membership to pursue it, Therapeutic Recreation, of course, being one of those professions. 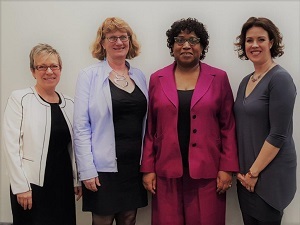 With that in mind, on Monday, April 10, 2017, Sue Verrilli, President, Jill Gibson, Board Director and Rozalyn Werner-Arcé, Executive Director met with Denise Cole, Assistant Deputy Minister, Health Workforce Planning & Regulatory Affairs Division, MOHLTC, Allison Henry, Director, Health System Labour Relations and Regulatory Policy, and Letitia Nolasque, Manger, Business Integration Services. The purpose of the meeting was to inform the Ministry about TRO and TR as a valued component of the health care system and for TRO to get an update on the status of regulation in Ontario. Below is a summary of our meeting. TRO prepared a presentation with an overview about TR and TRO, which was followed by discussion. There are currently 26 colleges. The Ministry feels that this is too many to manage. They don’t have the tools to ensure the effectiveness of the colleges nor do they have the tools to ensure the public is safe. Some of those colleges are struggling financially. There is an acknowledgement that ‘one size doesn’t fit all’. In other words, not every health care profession should be regulated under RHPA, but there are no other tools available at the moment. Too many professions want to become regulated for the wrong reasons. Regulation is not about advancing the profession. Regulation is about protecting the public. They are currently interested in the UK model of Right Touch regulation which has a governing body called the Public Standards Authority. In Ontario, this could mean a basket of options including a public registry, umbrella college, title protection, curriculum standards, etc. Whatever they decide upon, the Ministry favours a risk-based evidence approach. They are also looking at the issue of governance. Does it make sense that a college have 50% of practitioners on the board? Are practitioners the right people to govern their profession? Are there others better positioned? What about patients and family members? Professions have codes of ethics (including TRO), but how do they ensure that members adhere to them? A new “proof of concept’ PSW registry will be launched by the end of 2017. The former PSW Registry was considered an expensive list. They have re-worked the registry and the new version will be based on a code of ethics, standards and it will be mandatory. The Ministry will conduct a consultation process about the proposed changes. TRO requested to be included in the consultations. To summarize, change is in the air, but it won’t happen overnight. FEBRUARY 24, 2017 – Working together with the Therapeutic Recreation Provincial Education Steering Committee (TRPESC), TRO learned that the Ministry of Advanced Education and Skills Development (MAESD) Program Standards for the Recreation Therapy diploma and Recreation for Special Populations certificate programs are scheduled for review in their 2016-2019 plan. On February 24, 2017, our Executive Director wrote a letter on behalf of TRO to the MAESD Evaluation Unit offering to share our Essential Competency Framework (ECF) for Therapeutic Recreation document and provide support to the program standards review team during their 2018-2019 review. Click on the “Letter to MAESD” below to download the full letter. We were pleased to receive a response from the MAESD Program Standards and Evaluation Unit just three days later. The Senior Policy Advisor stated that they appreciate our offer to share the ECF to assist in the development of program standards for the college recreation therapy programs and will be inviting TRO to participate in the consultation process for the review and development of program standards slated to take place in 2018-19. To read the full response, click on the "MAESD Response to TRO" link below. The Ontario Government’s Ministry of Health and Long Term Care is continuing to move forward in their commitment to developing and implementing an Ontario Dementia Strategy. Public consultations took place in the fall of 2015 followed by the formation of working groups in the winter of 2015. Recreation and leisure play an integral role in life quality for individuals and communities and are in important component of person-centred, relational, and holistic approaches to health care. At times misconstrued as a means of diversion, when facilitated by properly trained Recreation Therapists and Recreationists, recreation and leisure can be instrumental in, and in fact essential to ensuring quality of life. Click here to review the submitted document. The Alzheimer Society i sseeking a fully-funded Ontario Dementia strategy (www.campaignfordementia.ca). On behalf of our membership, Therapeutic Recreation Ontario wrote a letter to Premier Kathleen Wynne, Hon. Charles Sousa, Minister of Finance, Hon. Dr. Eric Hoskins, Minister of Health and the two Health Critics Jeff Yurek (PC) and France Gélinas (NDP) to express our support for a fully-funded dementia strategy and draw their attention to TR as a key care component of that strategy which can help them achieve their goal of a fiscally sustainable health care system. Please feel free to forward this letter to your own local Member of Provincial Parliament (MPP) and ask them to support this vital initiative. Although the APO-TRO Dementia Joint Working Group was disbanded, TRO’s efforts in ensuring that Therapeutic Recreation is included within Ontario’s Dementia Strategy continue. Below is an update on what has transpired since our joint submission with APO was made to the Ministry in November 2016. Many thanks to Sherry Dupuis and TRO president, Leanne Hughes who organized a presentation at the recent TRO conference. Most notably, Sherry was able to secure Michael Campo and Justin Armstrong, Senior Policy Advisors at MOLHLTC, both of whom have Ontario’s Dementia Strategy in their portfolios, to also present at the conference. The joint presentation focused on our submission and the status of the strategy to date including 10 initiatives of the Ministry (click here to review the submitted document). Sherry has been an amazing advocate for TR at the Ministry level and having Michael Campo at the conference is a feather in our cap. It was a good opportunity for Michael to learn more about TR and engage with the session attendees. Following the conference, Michael reached out to Leanne, Sue Verrilli, past president, and Rozalyn Werner-Arcé, Executive Director, to organize a telephone meeting to discuss TR and its role in community dementia care. Thanks to Jeanette Sears, R/TRO and Anne Scanlon who provided good insights in preparation for the meeting. In addition, Michael invited us to attend a Healthy Aging Summit which will take place June 28 in Toronto. This will be a good opportunity to broaden our networks and raise further awareness about TR. TR’s can help facilitate the required culture change that must happen. In leadership roles and/or as consultants, they can have influence. We also sent Michael research that was gathered when the joint response was being written. We will continue to seek ways to keep TR top-of-mind for the planners behind Ontario’s dementia strategy. In the recent provincial budget, $10 million dollars was allocated to Ontario’s Dementia Strategy and thanks to TR advocates like Sherry Dupuis and at the provincial Behaviour Support Organization (BSO), we are hopeful that additional resources will be allocated to the role of TR in dementia community care programs. This is all very exciting movement forward for community dementia care and for TR practitioners. We thank the TRO members of the Dementia Joint Working Group who have contributed to the momentum. They are: Leanne Hughes, R/TRO, Sherry Dupuis, Jeanette Sears, R/TRO, Anne Scanlon, Dave Harris, R/TRO, Rozalyn Werner-Arcé. The Ministry of Health and Long Term Care (MOHLTC) hosted the Ontario Summit on Healthy Aging on June 28, 2017 at the MaRS Discovery District. The day consisted of keynote speakers and a series of panel presentations followed by audience q and a. Topics were very broad ranging including the senior care workforce, the diversity of seniors, age-friendly communities and non-medical transportation systems in communities for seniors. Representing the TRO membership, TRO ED, Rozalyn Werner-Arcé used the opportunity to network with Ministry officials and other health care stakeholders. While some speakers often referred to personal support workers and the health care system, Dr. Isser Dubinsky from the Institute of Health Policy, Management and Evaluation, University of Toronto referred to the entire care team including Recreation Therapists who contribute to enhancing a person’s quality of life during his remarks. This was a good opportunity to continue to raise the profile of Recreation Therapy as a profession that has a vital role in senior’s care, both in institutional and community-based care. We will continue to seek ways to strategically insert TRO and TR into these discussions. Interested TR professionals from both TRO and CTRA have been working together to develop a working group in Ontario with the objective to demonstrate the value of TR in community and present this information to the Local Health Integration Networks (LHINs). The group has conducted a comprehensive literature review to identify any gaps and to emphasize the need for TR within the community setting. We have also been working diligently to establish key contacts with the LHINs and other community networks such as Health Links. Our goal is to increase awareness about the value of TR while identifying gaps in the community, and cost savings associated with hiring TR professionals in the community. We will do this by developing a presentation which will be delivered to as many of the LHINs as possible.To help with this process, we need the support the TRO members! In response to concerns raised by members, the TRO board of directors formed the TRO - College of Psychotherapy Working Group to understand the impact that the new Controlled Act of Psychotherapy will have on Therapeutic Recreation (TR) practitioners and to share that information with our membership. While not applicable to all TRs, this has particular relevance for those who have received additional training in psychotherapy modalities such as Cognitive Behavioural Therapy (CBT) and Dialectical Behavioural Therapy (DBT). There have been many questions about who should register with the College before the grandfathering period is up (March 2017) and what the impacts are if people don’t register. The response was overwhelming to the August 2015 call for volunteers to sit on the Working Group. The terms of reference only allowed for 10 people and so we selected TRO members based on geography (provincial representation), experience, and workplace most likely impacted. Over the course of two meetings, we gathered information about the controlled act, learned more about the College, and attempted to understand the impact in some workplaces and how employers were responding. As there was still a need for greater clarity and because there was such great interest from the membership about the issue, we contacted Joyce Rowlands, Registrar at the College of Registered Psychotherapists of Ontario (CRPO). CRPO is still meeting with the five other Colleges to discuss the meaning of the controlled act of psychotherapy, and therefore cannot address our concerns at this time. However, we are pleased to announce that Ms. Rowlands has agreed to speak at the June 2016 TRO/CTRA joint conference to be held in Kitchener-Waterloo. We are planning a breakfast session for Thursday, June 2 from 8:00 am – 9:00 am. Additional details about the session and registration will be made available at a later date. Stay informed of the status of the Psychotherapy Act and potential implications for TR practitioners.Click the link above. Grandparenting is a time-limited, alternate route to registration which allows established practitioners in Canada with appropriate education and training and clinical experience to apply for membership as a Registered Psychotherapist (RP), without having to write the Entry-to-Practice Registration Examination. The grandparenting route is only available until March 31, 2017. With just over four months remaining in which practitioners may apply for membership via the grandparenting route, if you are eligible, or you know a colleague who has expressed interest in registering with CRPO but hasn't yet applied, please share this reminder. If you've already started the process, this might be a good time to log into your user account to review your profile and move things along. This will ensure there is plenty of time to seek answers to any questions you have, complete and submit the application well before the March 31st deadline. For further information, please visit the grandparenting page on the CRPO website. With the topic of therapeutic recreation practice in mental health settings being a central component in the College of Psychotherapy discussion, the committee felt they would like to pursue advocacy initiatives in this area and discussed the need to develop a proactive document/ position paper on the role of Recreation Therapy in Mental Health, from an Ontario perspective. The intention of this document would be to have a resource ready to use if members should need to advocate for positions etc. As per TRO's strategic plan and goals of increasing communication and strengthening the organization, an information letter for employers was mailed out to employers of TRO members across the province of Ontario in 2015. The purpose of this initiative is to educate employers about Therapeutic Recreation Ontario, discuss the Registration (R/TRO and R/TRO DIP) designation, including its purpose and process and share our new and exciting website. As a professional organization, we want employers across the province to be aware of TRO's purpose and how the organization can assist employers to remain current on the field of Therapeutic Recreation (TR) in Ontario. We also want to help them understand the value of the Registration Designation (R/TRO and R/TRO DIP) in terms of their hiring practices and have encouraged them to post TR job opportunities on the TRO Careers webpage. A follow-up Briefing Note was sent to employers of TRO members in 2015 announcing R/TRO DIP. Each year, the letter was mailed to human resource departments across the province and a Why Hire R/TRO? brochure was included. We encourage you to share these letters with managers, professional practice leaders, and fellow colleagues in order to educate healthcare professionals regarding Therapeutic Recreation Ontario and the voluntary registration registration (R/TRO, R/TRO DIP) process for TR professionals. Click below to download the initial letter and briefing note. In September 2016 an additional Briefing Note was sent to employers of TRO members outlining the Scope of Practice and the benefits of hiring a TR practitioner who is a Registered Professional member of TRO. The Disability Today Network approached TRO with an opportunity to write an article describing Therapeutic Recreation for this year’s Canadian Association for Prosthetics and Orthotics newsletter “Alignment 2015”. Our very own R/TRO Member Keli Cristofaro provided specific examples of TR interventions such as how she worked together with the team to help a young hockey player return to the rink with his new prosthetic leg. Thank-you also to Kimberly Lopez, Ph.D (C) from the TRPR-Journal of TRO for all your work as co-author on this article! Click on the link above to read the published article. October 2015, the TRO board of directors embarked on a two-day planning process to strategically advance the TR profession. Below is a link to the revised three year strategic plan which reflects the new considerations and strategies. After listening to subject matter experts, considering trends in TR and healthcare, and debating critical issues, the board fully believes that one of the keys to the future of TR is a scope of practice and as such, the board will undertake to lead this initiative immediately. This is a necessary piece of foundational work integral to creating new opportunities and with a renewed singular focus and increased capacity through our Executive Director, we are convinced it is achievable. In addition to this vital strategic priority, TRO will work with colleges and universities to advocate to the Ontario Ministry of Training for Colleges and Universities for TR curriculum standardization consistent with TRO’s Essential Competency Framework. Furthermore, the board recognizes that support of research in and about TR is essential to our messaging and we will develop strategies to gather and make accessible this information to our members. Another main focus of our discussions was the identification of a number of new and existing partnerships which will be important for advancing the profession. As TRO has communicated over the last two years, regulation is about protection of the public, not about elevating the profession. The primary criterion threshold for regulation under the Regulated Health Professions Act (RHPA) is risk of harm to the public. At this time, it is difficult for us to demonstrate risk of harm and the public’s self-interest in regulation of Therapeutic Recreation. But this should not impede TRO - your professional association - and we, as Therapeutic Recreation professionals, from taking control of our profession’s future and leading the way by creating opportunities in the new health care paradigm. Attached are links to information presented to the board of directors. Although it may seem out of context to those who were not part of the discussion, the board feels it important to share this information with the membership. If you have any questions, please feel free to contact Sue Verrilli, President or Rozalyn Werner-Arcé, Executive Director. Q. What is the difference between Scope of Practice and Standards of Practice? Q. Is TRO planning to pursue regulation?A. TRO is not pursuing regulation through the Regulated Health Professions Act (RHPA) at this time. For more details, please read the “Regulation in Ontario 2014” article. Q. How can I help Advance the Profession? A. We will need the involvement of members to help move this agenda forward! Once a review of our volunteer engagement process is complete, TRO will reach out to members for volunteers to assist with special projects–stay tuned to the e-TRO, website and TRO social media sites! Q. What is the difference between “registration” and “regulation”? Ontario examples: Lawyers, architects, engineers, accountants, etc. This is an update in terms of what has been happening in Ontario with regulation under the Regulated Health Professions Act (RHPA). A number of professional groups have been investigated for recommendation for regulation by the Health Professions Regulatory Advisory Council (HPRAC) this past year or so. The following groups were investigated and denied recommendation for regulation: physician assistants, paramedics and dental assistants. The reason they were not recommended for regulation matched what we were told by our consultants two years ago. Let’s look at the reasons behind the denials. Physician Assistants – insufficient evidence to meet risk of harm threshold. There are approximately 130 Physician Assistants practicing in Canada. Paramedics – the applicant did not meet risk of harm threshold. There are 7000 paramedics in Ontario, representing three levels of practice. Dental Assistants – insufficient evidence to meet risk of harm threshold. There are an estimated 20,000 dental assistants in Ontario. This information is important for TRO to reflect upon in terms of our change in direction in regarding regulation. Let’s ask ourselves the same questions we reflected on two years ago. Do we feel we have the number of members needed to go forward with regulation under RHPA? Two years ago we had less than 1000 members. We now have over 1300 members. Increasing membership is important for elevating our status in Ontario and we continue to work towards increasing our numbers. Do we feel we have an established risk of harm that is more so than paramedics or physician assistants? Our risk of harm does not include any controlled acts or jobs where we don’t work for someone else (for the most part). Is there a way we can combine with other professions that would make us stronger in numbers? When the government looks at regulation, they want to see that we have considered who else we might align ourselves with, such as Activity Professionals of Ontario or the Occupational Therapists of Ontario. And, if we don’t feel that regulation under RHPA is viable, what other options do we have for seIf-regulation? When reviewing the reports on the professions denied for regulation, there are recommendations TRO might consider for ourselves: title protection, mandatory registry, established scope of practice, etc. All of these areas were touched upon by the consultants two years ago. They are also areas that HPRAC recommended in their reports to the professions listed above. Some of the work TRO has done to prepare for regulation (for more details please see Next Steps Toward Regulation) include creating a code of ethics, standards of practice, registration (R/TRO) process, restructuring the board to include college like components, creation of new bylaws and procedures for bylaws and ultimately a letter to the Ministry of Health and Long-Term Care proposing regulation for therapeutic recreation in Ontario Please see the response to Part 2 of the Proposed Initial Draft Regulation on behalf of Therapeutic Recreation Ontario (TRO). With a change in government, they are currently not reviewing regulation letters for any profession. However, TRO plans to continue to lay the required framework for regulation such as demonstrating a unified profession, creating common education preparation and recognizing different levels of scopes of practice. TRO members have been interested in pursuing certification prior to its inception in 1999; however, the ultimate goal has always been regulation. Although TRO had voted (2007) to create an Ontario made certification model as a step toward regulation, in 2009 the TRO board recommended using the R/TRO as the minimum credential in pursuit of the ultimate goal of regulation. This decision was not made lightly as the TRO board considered many factors including an extensive review of other Canadian therapeutic recreation associations, advice of consultants and the fact that certification would be an additional voluntary step compared to regulation which would be mandatory -the ultimate goal. Certification by definition is a voluntary qualification/designation earned by a person to indicate they are qualified for a job. It consists of entry to practice, competency evaluation and a continuing competency program. Whereas regulation provides a framework for a scope of practice and it includes a general Act, a Procedural Code for all the regulated health professions. The purpose of regulation is to protect the public. The pursuit of regulation requires for example that we demonstrate a united profession including common education preparation, common competency review, common practice standards, common continuing competency, common job titles and recognizing different levels of scopes of practice. To download the presentation for this session, please click here. The presentation was also videotaped and can be viewed below. It is broken down into 5 sections as it is over an hour and half in length. Click on the section you wish to view. The video will open in a new tab. Once the video has fully downloaded the video will auto play. The speed of the download is dependent on your internet connection.